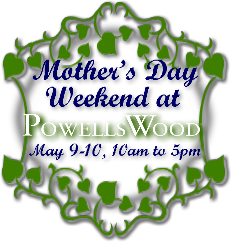 New garden spaces make it possible for PowellsWood to expand offerings at their annual Mother’s Day weekend event. Hours are 10:00 – 5:00 both Saturday May 9th and Sunday May 10th. Entrance is $5.00, free for children under 12. Visitors are requested to take the shuttle from Sacajawea Park, just east of the garden, at 1401 S. Dash Point Road. On-site parking is limited to handicapped vehicle parking only; please no parking in the neighborhood.